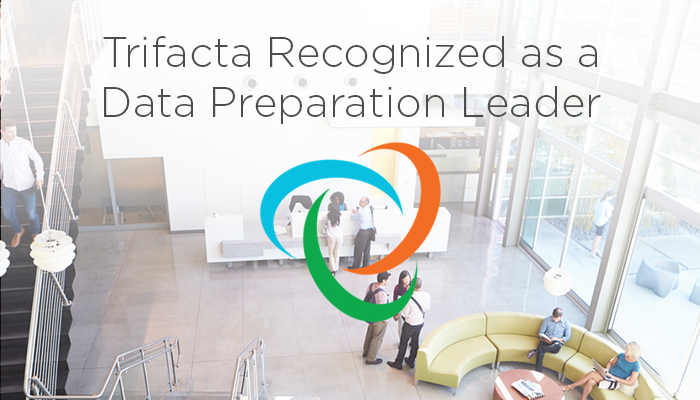 SAN FRANCISCO — March 13, 2017 — Trifacta, the global leader in data wrangling, today announced its position as a Leader in The Forrester Wave™: Data Preparation Tools, Q1 2017 report. The Forrester Research Wave report covering data preparation included the top data preparation vendors and evaluated them against 21 criteria, grouped by current offering, strategy and market presence. After vigorous evaluation, Trifacta came out as a leader, receiving among the highest scores in the Strategy category, comprised of product, partner and market strategy criteria. In the Current Offering category, Trifacta received the highest possible score in the Discover and Blend criterion (which includes Data Discovery and Machine Learning Capabilities subcriteria), the Standardize and Enrich criterion, the Transform criterion (which includes Cleansing, Transformation Assistance, and Transformation Execution subcriteria), the Security and Governance subcriterion, the Sharing criterion, and the Deployment criterion. To view the complete report, visit Trifacta’s website. Demand for self-service data preparation tools is at an all-time high. Data-driven organizations recognize the “urgency of speeding up their ability to use data for actionable insights.”1 Trifacta believes that this Forrester research report validates the establishment of the data preparation market category. It is Trifacta’s view that the report features the success it continues to have as a market leader and innovator. According to the report, “Trifacta delivers a strong balance for self-service by analysts and business users.”1 The report also states Trifacta “leverages machine learning algorithms to automate and simplify the interaction with data, making data wrangling self-service for analysts and business users” and “has the most sophisticated approaches of evaluated vendors for sampling and automatic transformation processing options.”1 Trifacta believes that this prestigious recognition solidifies its leadership position in the fast-growing data preparation market based on continued product innovation, strength of strategy and demonstrated results by delivering significant value to customers across industries around the globe. Trifacta Wrangler is used by tens of thousands of users at more than 4,500 companies in 135 countries around the globe. The world’s leading brands, including Google, PepsiCo, eBay, Munich Re, Royal Bank of Scotland, Kaiser Permanente, and LinkedIn are unlocking the potential of their data and accelerating time to insight using Trifacta’s market-leading data wrangling solution. Trifacta was recently selected as #1 end user data preparation vendor by Dresner Advisory Services for the third year in a row, selected as champion and top vendor in the 2016 Self-Service Data Preparation and Cataloguing Market Update by Bloor Research, won the Dresner Advisory Services 2016 Technology Innovation Award, and was recognized as an IDC Innovator for self-service data preparation. Driven by accelerating product adoption, customer success and business expansion, Trifacta continues to further its position as the number one data wrangling solution in the world.